a. Procedures for the development of Time-Phased Force and Deployment Data (TPFDD) and for the deployment and redeployment of forces within the context of the Joint Operation Planning and Execution System (JOPES) in support of joint military operations. b. Military guidance for the exercise of authority by combatant commanders and other joint force commanders for joint operations and training using JOPES. a. Crisis Action Planning Procedures. This document describes in detail the activities to be conducted in each CAP phase. However, in a fast-breaking crisis, CAP procedures can be significantly compressed and steps overlapped. Further, a crisis can be so time critical, or a single COA so obvious, that the first written directive might be a deployment or execute order. In these cases, the supported commander must ensure that all required actions from each CAP phase are completed whenever possible. To prepare for such eventualities within their area of responsibility (AOR), supported commanders should prepare and publish AOR-specific supplemental instructions to the standard TPFDD LOI (see Enclosure H) before the onset of a crisis to support assigned military operations. This planning will ensure that a TPFDD can be developed as rapidly as possible. b. Deployment and Redeployment Operations. These are operational imperatives that support the full range of military operations and are a function of the joint force mission. The joint deployment process begins when planning is initiated for force projection operations in response to an action or event that requires protection of US national interests. Deployment operations involve four phases: (1) Predeployment activities; (2) Movement to and activities at the port of embarkation (POE); (3) Movement to port of debarkation (POD); and (4) Joint reception, staging, onward movement, and integration (JRSOI) activities. Redeployment activities involve the transfer of individuals, units/or material, but are not necessarily the reversing of the deployment process. Redeployment may include movement of forces or material from one area to another, to another location in the same area, or to the zone of interior for further employment, or home. Redeployment operations encompass four phases: (1) Recovery and reconstitution and preredeployment activities, (2) Movement to and from activities at POE, (3) Movement to POD, and (4) JRSOI. During deployment and redeployment operations, the supported commander must build and validate requirements, determine predeployment standards, and balance and regulate the transportation flow. The supported commander performs these activities with assistance from assigned supporting combatant commands, Service component commands, Services, and combat support agencies. 1. General. 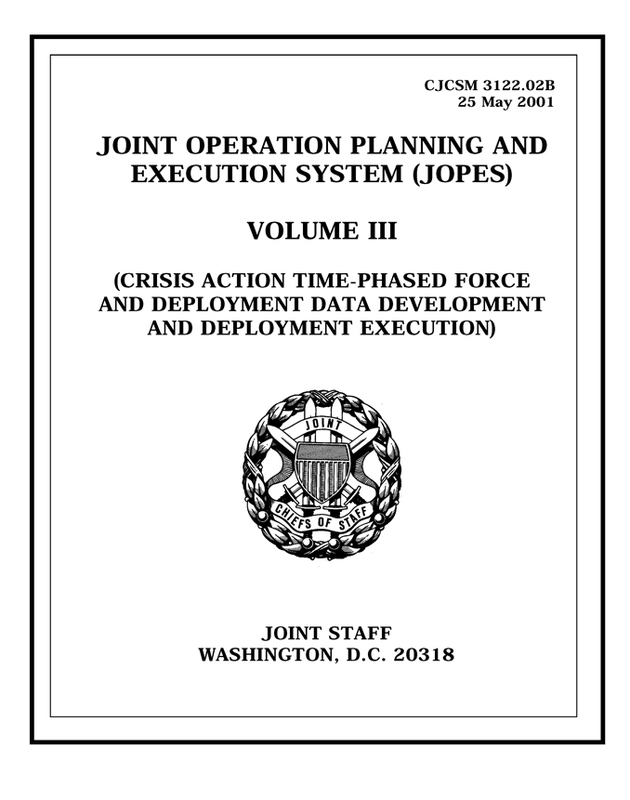 Phase III, Course of Action Development, begins with a decision to develop possible military COAs, normally transmitted by a CJCS warning order and ends when the Chairman of the Joint Chiefs of Staff analyzes the COAs contained in the supported commander’s estimate and the COAs are presented to the NCA. a. The Standard TPFDD LOI and AOR-Specific Supplemental Instructions. During the COA development phase, the supported commander will implement TPFDD development and execution procedures contained in the TPFDD LOI contained in this document. The JOPES standard TPFDD LOI provides procedures and direction to the supported commander and components, subordinate joint force commanders (including the Theater Special Operations Command (SOC)), supporting commanders, and other members of the JPEC pertaining to the identification of force requirements, the sourcing of forces to fulfill identified requirements, and the deployment and redeployment of those forces. During the COA development phase, if time permits, the supported commander publishes the AOR-specific supplemental instructions to the standard TPFDD LOI. An electronic copy of the standard TPFDD LOI is also located at <http://nmcc20a.nmcc.smil.mil/~dj9jfdbm.html>. These AORspecific instructions describe theater-specific force deployment planning and execution procedures such as intratheater lift constraints, validation windows that deviate from the standard TPFDD LOI for reasons such as overflight clearance, APOE/D/SPOE/D requirements, additional validation procedures, etc. The supported commander should publish these AOR-specific instructions on the local JOPES webpage. Appendix E contains sample CINC/AOR-specific supplemental instructions to the standard TPFDD LOI. Both the standard TPFDD LOI and Appendix E are made available on the supported commander’s home page in the area containing information relevant to the crisis. Adherence to the standard TPFDD LOI and the CINC/AOR-specific supplement is key to successful conduct of deployment and redeployment operations.